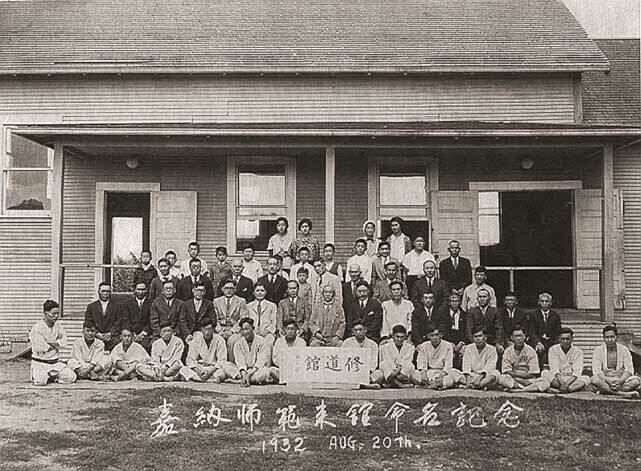 In 1926 members of the Japanese-American community approached Mr. Bunazaemon Nii, an instructor of Kito Ryu Jujutsu about forming a Judo club for the benefit of the young people of the community. Mr. Nii and a partner had given a demonstration of Kito Ryu Jujutsu at the Lewis & Clark Exhibition of 1905. The dojo was then known as The Portland Judo club. The club continued training through the 1930’s and hosted two visits by Jigoro Kano, the founder of Judo in 1932 and 1938. On his second visit, upon the request of the dojo, Kano shihan devised a Japanese name for the club. He chose the characters “O” to represent Oregon (this is a phonetic reading the literal meaning is “central”), “bu” which means martial arts or training, and “kan” which means training hall. Kano shihan then presented the dojo with his calligraphy of the name and Portland Judo Club became Obukan. With the tragic internment of Japanese-Americans during the second world war, Judo training at Obukan stopped. Then in the early 1950’s, Judo again started being practiced in Portland. There were clubs at the YMCA and Reed College. Members of these clubs joined together with former Obukan members and the Japanese-American community to revive Obukan Judo dojo. Judo training at Obukan has continued uninterrupted from 1953 to this day. 1905: Mr. Nii and a partner had given a demonstration of Kito Ryu Jujutsu at the Lewis & Clark Exhibition of 1905. The dojo was then known as The Portland Judo club. 1926: Portland Judo CLub is formed. Nii Sensei is hired as head instructor. 1932: First visit of Jigoro Kano, founder of judo. 1938: Second visit of Jigoro Kano, Club is visited by Professor Jigoro Kano, the founder of Judo. Kano officiallyrenames the club to Obukan. 1942: World War II forces Obukan to close it’s doors. 1954: First official post war dojo meeting. Ryusho Honma sensei becomes first full time instructor. 1955: Obukan’s first post war tournament. Jim Onchi sensei becomes Obukan’s head sensei.